You are here: Home » What’s Under The Surface…? If your life isn’t going the way you want, you may want to look a ‘bit’ deeper (the 90% under the surface) and examine what programs (thoughts, feelings, memories, traumas, etc) may be running. But how do you even detect what’s running under the surface? Many people strive so hard to overcome life issues but they realize that almost every method they use seems to fall on “deaf ears”. Because the re-curring problems in our lives are created by our sub-conscious mind (not the conscious mind) but many of us weren’t taught to speak the language of the subconscious. 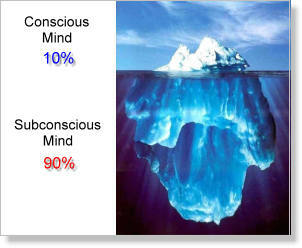 Your subconscious dictates over 90% of everything that happens in your life. Most people are unaware of what’s running in that 90%. When you feel that you’ve tried everything and it still doesn’t work, or when you notice problems that re-occur, the cause is un-conscious programs that are running in your subconscious mind. be at peace with this challenge? But what if it doesn’t let go? and b – r – e – a – t – h – e . . .
subconscious and your conscious minds.